These delicious (and simple to make) honey mustard chicken salad sandwiches are a fun twist on typical chicken salad! They’re a hit wherever they’re served! 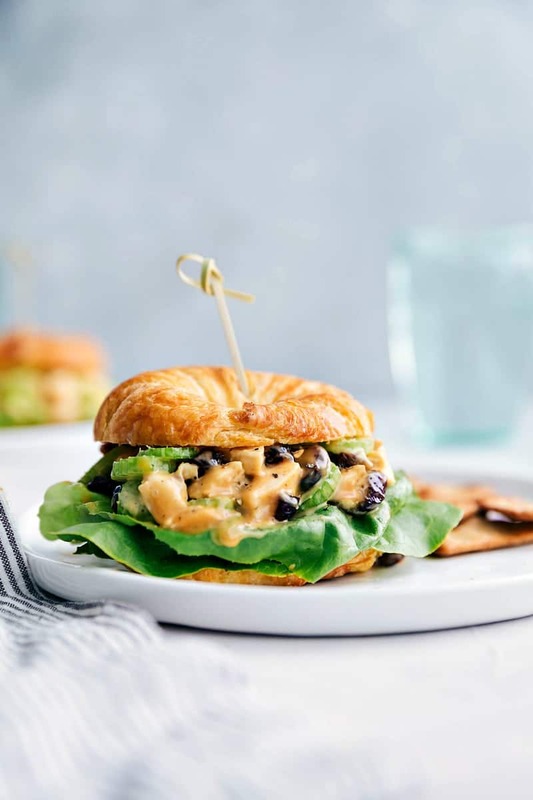 In all honesty, we eat chicken salad more often on wheat bread than on croissants to keep them healthier, but I do love chicken salad on a croissant the very best! My go-to chicken salad recipe is a favorite in my home and I make it often for events because everyone loves it. My sister and I threw my (then soon to be) sister-in-law and brother a bridal shower earlier this summer and after serving that chicken salad, they requested it on the menu for their wedding luncheon. It’s really the best chicken salad and so as I set out to make a variation on that recipe, my expectations (as well as my taste testers) were very high. Luckily this honey mustard chicken salad ticks off all of my requirements and passed the taste tests with flying colors — it’s a total winner! 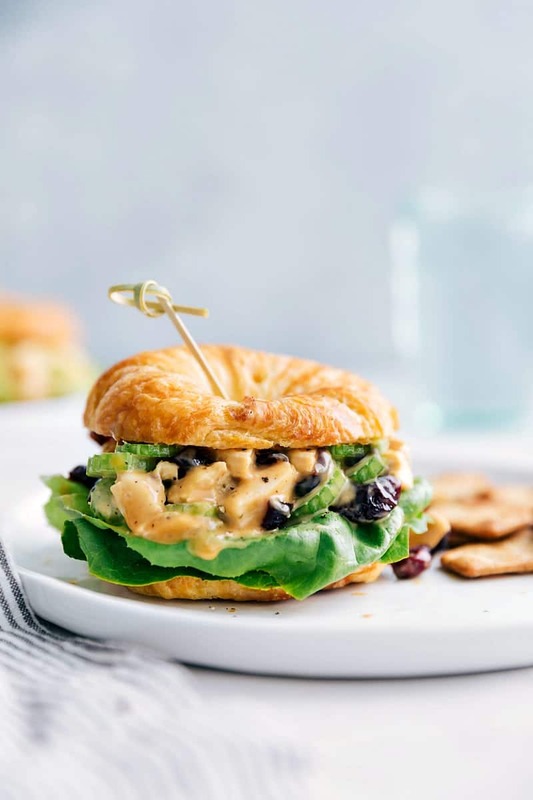 How do you make this honey mustard chicken salad sandwich recipe? If I’m making a lunch sandwich I want it to be FAST! And this recipe prep time (10 minutes or less) definitely delivers. Instead of having you cook up chicken (which you definitely can!) I like using a shortcut which is also what I consider to be the “secret” to having the best chicken salad: using a tender and flavorful rotisserie chicken! But how do you get super flavorful chicken in a flash? A pre-made store-bought rotisserie chicken OR a leftover homemade rotisserie-style chicken. I grab a rotisserie chicken and chop up the meat from that (about 2 cups) and then use the remaining chicken in one of the many recipes on my site that call for rotisserie chicken . If you’re in a super big hurry, a lot of grocery stores even have rotisserie chicken they’ve already cut up for you (a bit more spendy, but great in a pinch)! If you’re planning on making this for a lot of people, this recipe easily doubles, triples, etc. 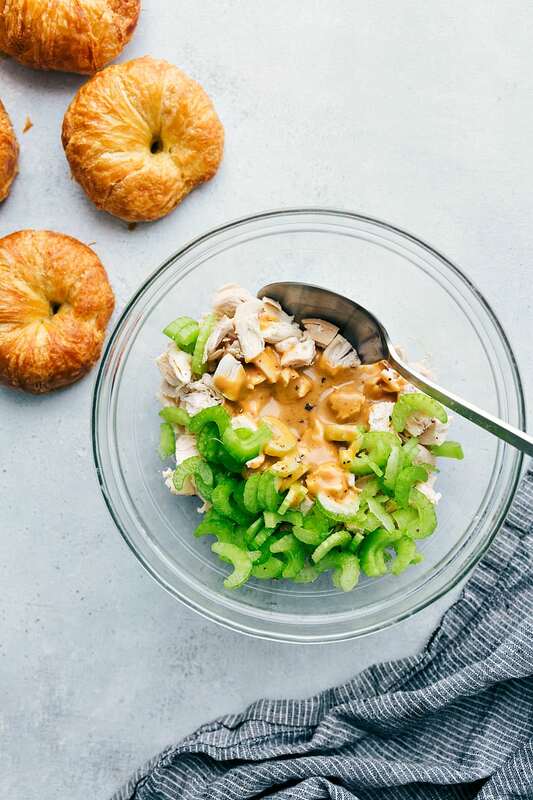 If you get a colossal-sized rotisserie chicken you’ll get about 6 cups of meat which you could use for this recipe and just triple all of the other ingredients! Does this honey mustard chicken salad use dijon mustard? 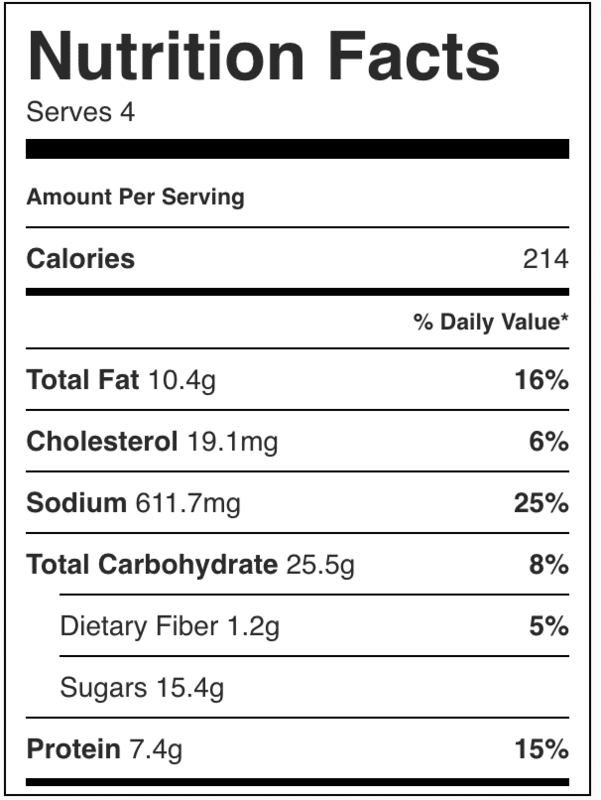 No; while most honey mustard chicken salad sandwiches do, this one actually uses regular yellow mustard! I’m using my famous “chick-fil-a” copycat sauce! 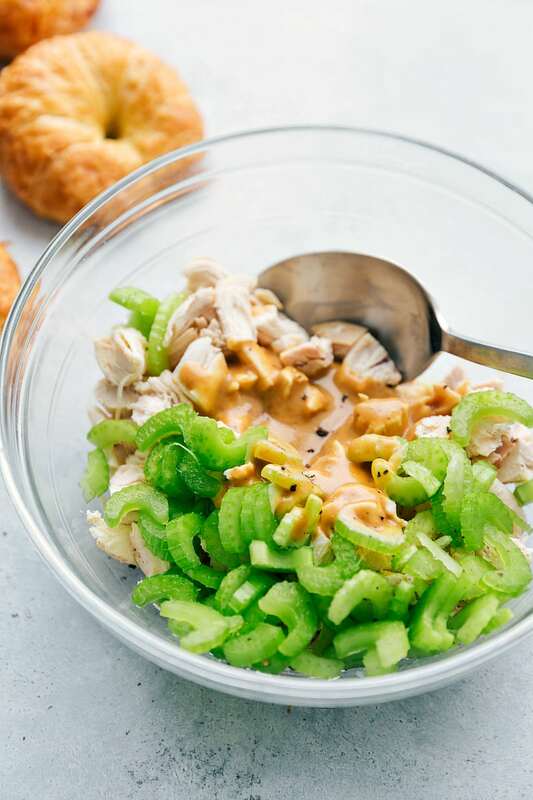 This recipe is raved about and insanely good on chicken salad! Whisk together until smooth! Taste and adjust seasonings and use in place of the other sauce in this recipe. 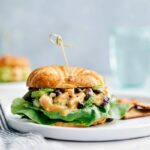 How should I prepare the chicken for these honey mustard chicken salad sandwiches? I LOVE using rotisserie chicken: I’ve already mentioned it, but rotisserie chicken is fast, flavorful, and tender! I like grabbing one from the store (or making one homemade) at the beginning of the week and then using it in recipes throughout the week. Check out this post for more details on that process! If you’re really in a time crunch, lots of stores even sell pre-shredded rotisserie chicken meat. Alternatively, you can grill the chicken: Besides using a homemade or store bought “rotisserie chicken” I love grilled chicken! If you want to use grilled chicken for this recipe, I wouldn’t marinate it (so the flavors don’t compete with the dressing) but be sure to generously salt and pepper the breasts and then drizzle on some oil on both sides. Pound them to even thickness and grill over medium-high heat (450 degrees F) turning once halfway through grilling, about 4-6 minutes per side (until the thickest part of the chicken registers 165 degrees F.). Transfer the chicken to a plate and cover with foil. Allow the chicken to rest for a few minutes so the juices can re-distribute! Thinly slice and then chop the grilled chicken and it’s ready for this recipe. These delicious (and simple to make) honey mustard chicken salad sandwiches are a fun twist on typical chicken salad! They're a hit wherever they're served! 1/3 cup dried cranberries cherry infused for an even more delicious chicken salad! In a large bowl, add in the chopped rotisserie chicken, dried cranberries, and thinly sliced celery. In a separate bowl, whisk together the coleslaw dressing, mustard, and BBQ sauce. Whisk until smooth and season to taste with salt and pepper. Adjust quantities to your preference. Gently stir all of the ingredients together until combined. Taste and adjust for any additional salt/pepper. Enjoy layered on toasted bread or a croissant and add some lettuce. Enjoy immediately. 0 Response to "HONEY MUSTARD CHICKEN SALAD SANDWICHES"